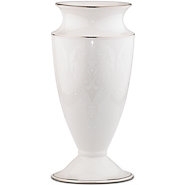 Three bands of precious platinum encircle The Opal Innocence 9" Vase. Scrollwork accents form a heart-shaped motif on the vase, which bears dozens of enamel dots. In neutral white, the vase makes a versatile home decor piece and a much-appreciated gift.